← Coming Soon: The Frankenstein Zombie Terminal? This article is an updated and expanded version of an article originally published in the online journal Orcas Issues. In the end, after five arduous years of coal and controversy, it all came down to fish. 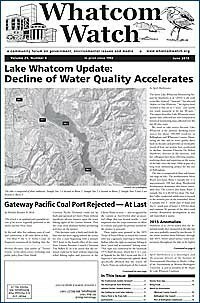 On May 9, 2016, the U.S. Army Corps of Engineers announced its finding that the Gateway Pacific Terminal could not be built and operated at Cherry Point without significant adverse impacts upon the treaty fishing rights of the Lummi Nation. Thus the corps must abandon further permitting activities on the project. This decision ends a back-and-forth debate that has been raging behind the scenes for over a year, beginning with a January 2015 letter to the Seattle office of the corps from Lummi Business Council Chairman Tim Ballew II. In it he stated that the terminal could not be built without impacting tribal fishing rights and practices in the Cherry Point vicinity — also recognized by the Lummi as Xwe’chi’eXen after an ancestral village that was located nearby — and requested that the corps terminate its effort to evaluate and grant the permits needed for the project to proceed. These rights were granted in the 1855 Treaty of Point Elliott, to which the Lummi tribe was a signatory, reserving to Northwest Indian tribes the right to continue fishing in their “usual and accustomed” fishing areas. That right was confirmed by the landmark 1974 Boldt decision, which the U.S. Court of Appeals for the 9th Circuit and the U.S. Supreme Court subsequently upheld. Boldt specifically affirmed that the waters off Cherry Point are indeed part of the Lummi Nation’s usual and accustomed fishing areas. At the core of the debate between the Lummi Nation and terminal proposer SSA Marine was how serious the adverse impacts would be, and whether or not they could be mitigated by appropriate measures. SSA Marine contended that the Cherry Point waters were not regularly fished by the Lummi, who refuted the claim with their fisheries data from 1975 to 2014 and sworn statements by tribal fishermen. SSA Marine also asserted that adverse impacts could be mitigated by such measures as providing areas for fishermen to lower their crab pots from the landward side of the piers. But corps officials did not buy these suggestions and decided that the impacts would inevitably exceed the “de minimis” level — defined as the absence of legally significant impacts. Just imagine, if you will, the poor Lummi crabbers trying to work around bulk carriers over three football fields long coming and going more often than once a day, with coal dust swirling all about and coal particles settling to the sea floor, lodging in the gills of hapless Dungeness crabs scuttling blindly about in the darkening abyss. But the corps concentrated on physical impacts and obstructions imposed by the terminal piers and by bulk carriers reaching the port. Little mention was made of the additional adverse impacts that the many tons of fugitive coal dust entering adjacent waters would have upon the environmental health of Lummi fisheries. The GPT project is thus effectively dead, because the corps may not permit a project that abrogates Native American treaty rights. Whether the project could still rise from the dead like Lazarus depends on whether its proposers can lean into these stiff economic headwinds and still have the stomach to mount a costly legal challenge. That’s pretty unlikely, given that the coal companies backing this project, including mammoth Peabody Energy and Arch Coal, are now in bankruptcy court or about to enter it. Terminal opponents are jubilant — and deeply grateful to the Lummi Nation for its staunch, unwavering leadership in this five-year struggle. Problems of fugitive dust, diesel fumes, and excessive noise from passing coal trains dominated Whatcom County concerns, as did the blocking of at-grade railway crossings that would inevitably occur for a total of more than an hour each day due to the umpteen mile-long full or empty trains lumbering past. Residents of the San Juan Islands focused on underwater noise and the potential spills from the 487 hulking vessels that would have traversed our waters annually. But many of us recognized full well that the Lummi Nation held the strongest hand in this exhausting five-year poker game, with Boldt securely up its sleeve. In the end, it all came down to the inalienable Lummi right to continue fishing the Salish Sea waters just as they have been doing for centuries. Michael Riordan, lead author of “Tunnel Visions,” writes about science, technology and public policy from Orcas Island.